Many men and women face the difficulty of balding or thinning hair. Cutting-edge hair restoration treatments allow patients to recapture their lost identity and restore their sense of self-esteem, which often comes with a full head of hair. The most well-known hair restoration solution is a modern hair transplant. This surgical procedure offers incredible results. However, not all patients are candidates for hair transplants; as such, some seek out questionable medical alternatives. PRP — or platelet-rich plasma — therapy is a hair treatment that is supposed to promote the regrowth of hair. This non-surgical solution is not a new technique, even though it is constantly promoted as such, and has been offered for years as an option for those who are not ideal candidates for hair transplant surgery. The cost is usually about $800 to $1,200 per treatment and while its efficacy is questionable at best, the unnecessary trauma it causes to the scalp is an absolute reality. Modern hair transplantation is a fairly straightforward concept. Most people who experience hair loss still have an abundance of hair growing on the back and sides of their head. This region of the scalp is known as the donor area. Skilled physicians remove some hair roots and place them in the balding areas on the top and front of the patient’s head, in the recipient area. Follicular Unit Transplantation (FUT): Considered the gold standard in hair transplants, this method involves removing hair roots from the back and sides of the scalp in thin strips. Follicular Unit Extraction (FUE): This technique removes hair roots individually from the donor area. The patient has a moderate amount of blood drawn-about 60cc which cannot be considered a small amount as advertised by its advocates. This blood is placed in a centrifuge so that the plasma separates from the other cells and becomes concentrated. A technician fills a syringe with the platelet-rich portion of the plasma. The areas of the scalp in need of hair restoration are injected with the plasma. Then the scalp is stabbed a few hundred times to “activate” the plasma. In general, the entire process takes less than two hours, and discomfort is minimal. All patients receive a local anesthetic so that they don’t experience any pain during the procedure. Which Hair Restoration Procedure Is Best for Each Situation? Many different types of hair loss are experienced by those seeking hair restoration treatment. The kind of hair loss you have helps determine whether you should have a hair transplant at all or should explore alternatives. Hair transplants are effective treatments for individuals who have significant balding or thinning areas of their scalp, such as those with genetic hair loss, also called male or female pattern baldness. This type of hair loss usually occurs on the top or front of the head, with hair on the sides and back remaining. The permanent hair is used for the procedure because it won’t be affected by the hormones (DHT) that cause balding. The first is the doctor who just doesn’t understand what PRP really is or how it actually works. This doctor just genuinely believes it may work and that it has no risk associated with it so he figures why not use it? What this doctor does not understand is that PRP inflicts a massive amount of trauma to the scalp and what he thinks is benign is actually very damaging. The second doctor is a hair transplant doctor who usually gets poor results from his hair transplant surgery compared to other doctors. In the hopes of improving yield, this doctor looks to PRP. However, what these doctors don’t understand is that it is most likely careless graft handling by their own technicians during surgery that is causing the low yield and not poor growth due to some inherent factor that PRP will somehow will miraculously compensate for. The third doctor, and most egregious, doesn’t care if PRP actually works or not. He just uses PRP as a marketing tool to attract patients to book for either a PRP procedure at $800 to $1,200 per pop; or, to entice hair loss sufferers to go with his clinic for a much more expensive hair transplant procedure because he uses PRP in conjunction with it. Sort of how a car dealer throws cheap car mats into the deal to get you to buy the car. It is NOT a good deal. Platelet Rich Plasma is just bad. There is evidence that patients who are suffering from the very beginning stages of hair loss MAY benefit initially. But this is mostly conjecture. And even if a significant amount of improvement is noted (which is extraordinarily rare and most likely due to factors having nothing to do with the PRP procedure itself) it only lasts for a SINGLE treatment. Follow up treatments do not seem to have any cosmetically useful effect or benefit. 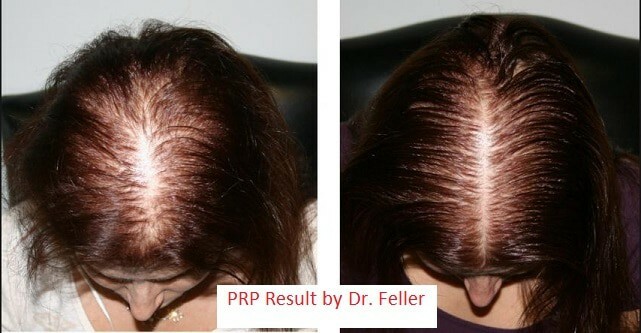 Quite the opposite in that PRP causes massive damage to the scalp because the injections and the multiple stabbings required to “activate” the plasma causes so much fibrosis that the skin becomes noticeably hard. This fibrosis in turn diminishes the valuable blood vessels and nerve endings necessary to sustain the hair it was designated to save in the first place. In short, after the first treatment, PRP becomes more a liability than an advantage. So if the question is: Hair Transplant or PRP ? The answer is: YES to the hair transplant if you are a candidate; and NO to PRP no matter the circumstances. If you struggle with thinning or balding hair, it’s important for you to see a hair loss specialist who will guide you through this process and help you choose the best possible treatment for you. Our specialized hair restoration physicians at Feller and Bloxham Medical in Great Neck, NY, have honed their skills over 20 years of practicing this specialty, and they offer their experience to patients in need of hair transplant surgery. To find out if you’re a good candidate for our hair restoration services, contact us online or call (516) 487-3797 to schedule your consultation.